THE WEDDING!THE WEDDING!THE WEDDING!THE WEDDING!THE WEDDING!THE WEDDING!THE WEDDING!THE WEDDING!THE WEDDING!THE WEDDING!THE WEDDING!THE WEDDING!THE WEDDING!THE WEDDING!THE WEDDING!THE WEDDING!THE WEDDING!THE WEDDING!THE WEDDING!THE WEDDING!THE WEDDING!THE WEDDING!THE WEDDING!THE WEDDING!THE WEDDING! I was very disinterested in the wedding, until the day before. It suddenly became clear to me that a) getting a day off from the School Run of Physical and Psychological Trauma was actually awesome and b) having parties and drinking Pimms and buying bunting and making victoria sponge to be eaten at 10am was also similarly awesome. And then, of course, there was the wedding guest outfits to wonder over, and discuss at length. And then, I fell in love with Kate Middleton. Who knew that I would turn out to be a Kate-Lover? I nearly died from the Kate-Love, and when The Dress turned out to be McQueen, and it was all Grace Kelly-esque and gorgeous, and she looked so tiny and she EVEN DID HER OWN MAKE-UP, well, I just actually died a million times from the sheer fabulousness of it all. Mark was similarly affected, which is another reason why he is an excellent catch. The poor children got bored and ate half a pot of jam with their fingers before we could tear our eyes away from the BBC. And I made scones and baked a ham and we drank prosecco in an effort to be British and supportive and authentic and I even squirted little tears whenever I thought about Kate, whom I now Properly Love. I expect we could be friends, although I may get a little bit giggly when she says “holy” and “very”. We could go shopping on the King’s Road. I am actually a little bit posher than her in some crucial ways, of course, because I don’t bother much with the high street, and I certainly wouldn’t wear an angora cardi anymore, nor would I bother with honeymoon clothes from Warehouse, because my internal goalposts have shifted and now I only like properly expensive stuff. As for the polo and the game fair, I know I would get VERY BORED, but she could teach me about luscious hair and we certainly could go over blusher application a little bit. Anyways, about the hair. And a bit of me curled up and died. Not in a good way, either, like the dying I did when Kate smiled at me through the telly and telepathically suggested that we could hang out when she gets back from Wales. In a MORTIFIED naked ugly I-really-have-to-stop-going-to-Aveda kind of way. Needless to say, Kate wouldn’t have been quite so blunt. So, that was gigantically awkward. But then I had the wedding, and that pulled me through, and now I feel like School Camp is over, and am all empty on the inside, and wonder if I shall ever truly, really, have fun again now that the bunting is down and the flags have been ripped and the ham turned into ham and potato hash. I know I should be filling up my aching Kate-shaped hole with finishing Doris Lessing’s The Golden Notebook for book club, but it is frankly a little bit boring and I have a raging hunger for wedding day details and related frippery. I shall leave you with this. 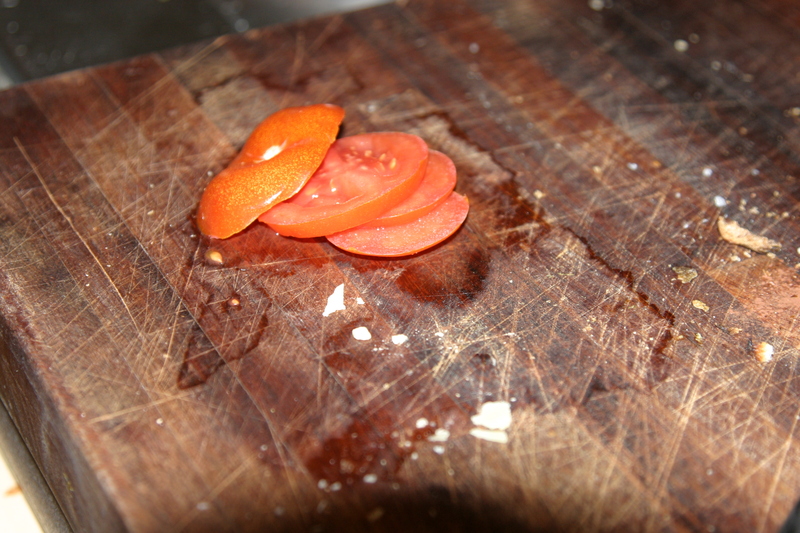 My Archilles Heel – bits of wet, weepy tomatoes left on the bench, every day of my married life. 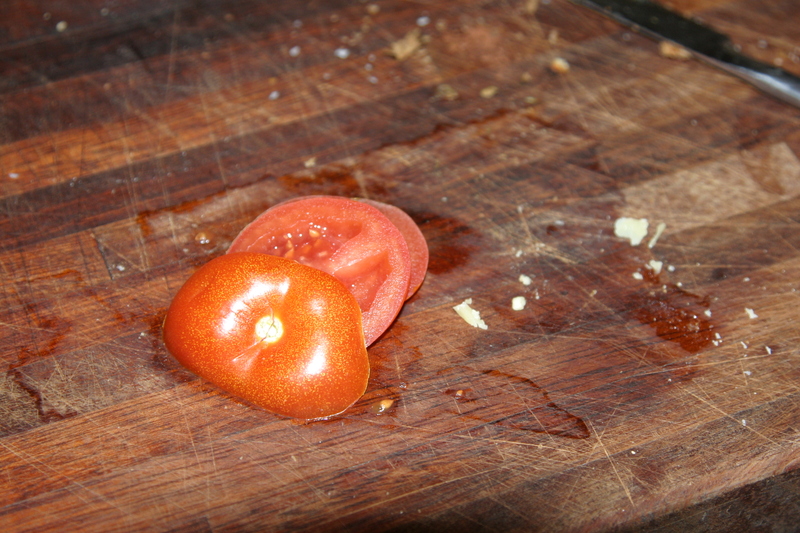 If I ever divorce, it will be because of the tomatoes. Enjoyed reading this piece. With you on the girl crush and wilting tomato thing. Bet your haircut is fab. haha at the tomato. I too wasn’t that interested in the wedding until the week before – but I loved it… and the excuse to eat yummy and fattening things late at night! Hate the wedding, hate the bloody Royals, love short hair. Running fingers through short curly ringlets is one of the most stimulating things that is still legal. YOU decide, it’s your hair. Not too sure about the tomatoes. Did you leave them or another. I think the new hair cut is lovely, but then you and the brood always light up the streets of Bayswater and it would be hard to have a ‘do that diminished that. As for Boris Dressing’s Golden Notebook….I would cheat and read some reviews and Wikipedia, rather than actually wade through that tome. I’ve got a dreadful Kate-crush which did not exist before I saw her in her wedding dress. This is now followed by a proper ‘Middleton family’ crush generally as Pippa was GORGEOUS and everyone’s outfit just hit the right mark. I’m not counting Eugenie or Beatrice though. What a perfectly MEAN thing to say about your hair! I have a friend who sounds a bit like this lady – revs up mouth before brain is in gear properly. This friend has commented on my lovely bright blue goddessy top that I clearly LUFF to death: ‘oh it’s made out of dishcloth material’, from which I think you’ll find there is no conversation retriever. I don’t have the tomato detrius, but I do find cereal bowls with frosties dried in so hard that you’re as well to just throw out the bloody bowl. Ummmm, some of us, who live on the west coast of the US — specifically San Diego, perhaps you remember me from my post last October or whatever? — and who drop in occasionally to read your blog but who have no first-hand knowledge (“knowledge by acquaintance” as B. Russell called it) of your short hair, are left wondering why a post labeled “she thinks my hair is horrible” is illustrated only by … two pictures of post-lacerated tomatoes? Are we getting a bit camera-shy in our so-called “old age”? Dear jerry b, I have left about 6 photos in the latest post so you can see both spots and varying lengths of bad hair, as well as some broken capillaries and the odd double chin. ENJOY!